The Hot Burgers is responsive Joomla! 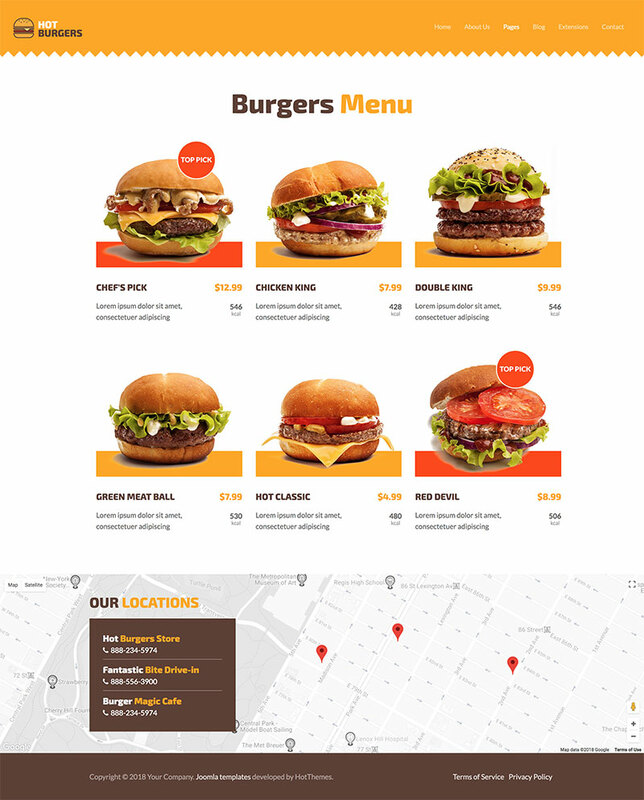 template dedicated to fast food restaurants that have burgers as the main offer in their menus. 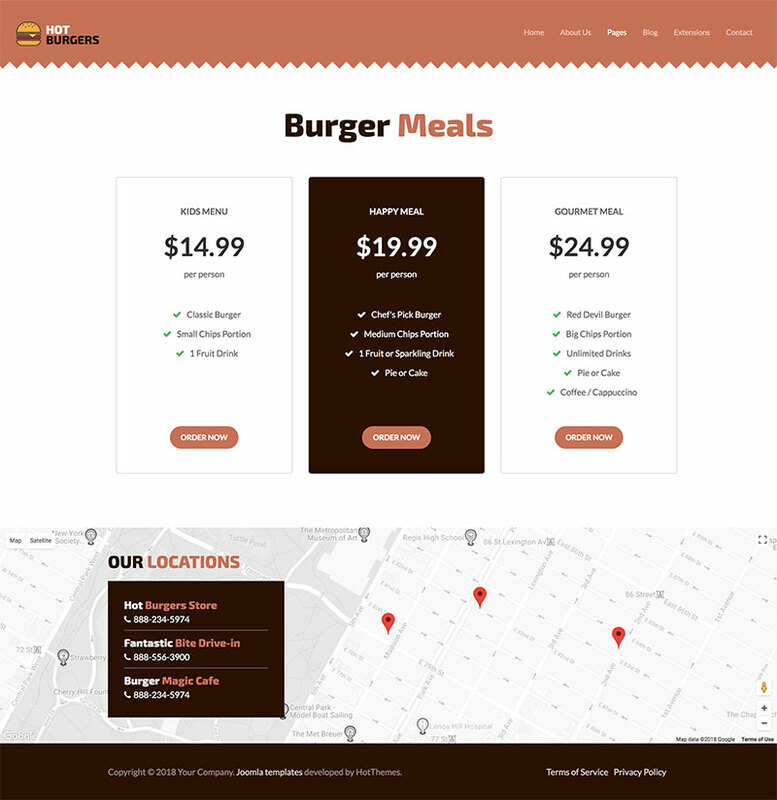 This template will be a great starting point for making the online menu for any restaurant. All specialities of any fast food restaurant are just a click (or tap) away from the customers. It contains 4 differently designed instances of the Swipe Carousel module (We've broken a record) in the various places throughout the long home page. The first carousel instance contains featured products (burgers) recommended by the restaurant owners or chefs. The second instance is a simple slide show gallery. It's helps visitors to learn more about the atmosphere in the restaurant and to show some happy guests or events. The third carousel is probably the most complex one. It's an endless carousel with multiple slides on the screen. It shows all the specialities offered by the restaurant with short description and price for each one. Finally, the fourth carousel shows guests testimonials. All these carousels together with other elements create a long page that represents the home page of the fast food restaurant. The remaining space is used to show the main ingredients of the burgers with short explanation of each ingredient. In the footer area, you will notice a styled Google map with multiple markers that represent the fast food restaurants in various locations. All this done by the Hot Maps module and included with template. The interior pages are also included. It will be easy to modify our demo data for your restaurant menu page or page with special offers and bundles. There are also many other pages included and you can check them all on our demo. Responsive template, based on clean HTML5/CSS3 code. Customisation of the template's layout and adding/removing module positions is easy. It's powered by Sparky's drag and drop Layout Editor. Change layout and element's dimensions easily whenever you need. Retina ready images in articles, custom modules and carousel. Full support for modern screens with double pixel density. 5 color schemes included. You can change any color easily to make your original color scheme. We included several responsive Joomla modules with this template. Hot Swipe Carousel (retina ready and powered by CSS animations), Hot Slicebox, Hot Responsive Lightbox and Hot Maps. All these modules are included with this template without any additional fees (you save $15 per commercial module). HotStart (SQL dump) available with both single purchase or any membership plan. It copies template with all extensions and demo pages easily. Unlimited number of module positions can be added easily within Layout Editor of Sparky Framework, if needed. Total control of all menus through the framework. You can set functionalities and style of all your menus and drop them directly into the layout. 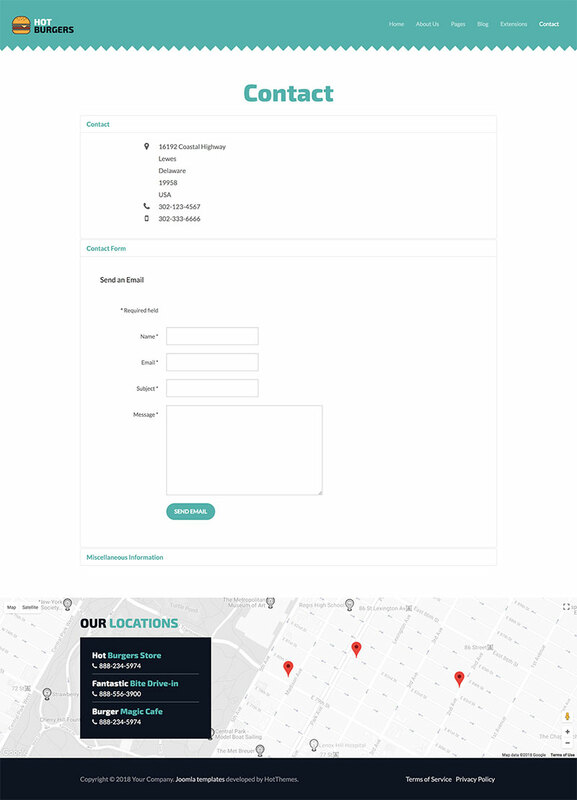 This template uses Drop-down menu which allows multiple levels of menu items to be included in the drop-down panes. This template has been tested with Chrome, Edge, Firefox, IE10+, Opera and Safari browsers on PC and Mac computers. It's also tested on iOS and Android mobile devices.